QUESTION: Should we worship and pray to the Holy Spirit? Is it one of the three persons that composes the Trinity (Godhead)? ANSWER: Critical to the discussion regarding whether we should worship the Holy Spirit is whether or not it is a person and part of a Triune Godhead. The Trinity doctrine is considered one of the essential and foundational beliefs of modern Christianity. Based on what most denominations officially teach, it seems almost as a natural conclusion that if the Holy Spirit is God then it deserves worship. Most church people, especially those who worship on Sunday, have been taught that the Holy Spirit is a co-equal third part (hence the term Trinity) of the Godhead. The basic teaching is that God is actually composed of three distinct persons (the Father, the Son and the Holy Spirit). The First Council of Nicaea, presided by Constantine the Great in 325 A.D., was a collection of early Catholic church leaders. One of its many decisions was to officially endorse belief in the Trinity that would ultimately lead to its worship. The best times to pray! It took only 56 years for the worship of the Holy Spirit to be officially endorsed and promoted by Christendom. The First Council of Constantinople, another collection of Catholic church leaders, was held in 381. It expanded on the Nicean Creed of 325 that supported the Trinity to include the words, "And in the Holy Ghost (Spirit), the Lord and Giver of life . . . who with the Father and the Son together is worshiped . . ."
"The New Testament begins the work, but does not finish it; for it contains no similar teaching (like John 1:1 - 18 concerning the divinity of Christ) with regard to the Holy Spirit. The unique nature and mission of Christ are traced to a ground in the being of God; but similar ground for the divineness of the Spirit (meaning it is part of the Godhead) is NOWHERE SHOWN" (An Outline of Christian Theology, W.N. Clark, page 168). "In Scripture there is as yet no single term by which the Three Divine Persons are denoted together" (Catholic Encyclopedia, Volume XV, 1912). The Bible also does not teach that the Holy Spirit is worthy of worship. It does teach, however, that the Father and Jesus Christ are both God. The most succinct statement of this relationship is found in John's gospel. He states, "In the beginning was the Word, and the Word was with God (the Father), and the Word was God" (John 1:1, HBFV). In John's introduction to his gospel (John 1:1 - 18) NO mention is made of the Holy Spirit or its believed divinity. Such an omission would be blasphemous IF it was worthy of worship like the Father and Son! 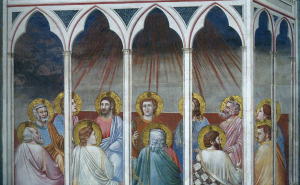 What, then, is the Holy Spirit? According to the Bible, it is the impersonal force or power God uses to fulfill his will. It emanates from both the Father and Son (Romans 8:6 – 11). It was the power used to raise Jesus from the dead (Romans 8:11). This same power lives in true Christians and enables them to build righteous character and obey their Creator (verse 7). The Holy Spirit is the power God, who alone is worthy of worship, will use to resurrect Christians from the dead and make them a part of his family (Romans 8:15 - 17, 28 - 29, see also 1Corinthians 15). The best places for prayer! How many angels followed Satan?